From ID Challenge #1 (posted December 23). With numerous species photographed during the year and several of these dramatic “face on” shots, this was a hard choice. I chose this one because of the metallic colors, good focus throughout the face, and evenly blurred “halo” of hair in a relatively uncluttered background. From Special Delivery (posted July 13). I didn’t have that many jewel beetles photos to choose from, but this one would have risen to the top no matter how many others I had. The use of a white box shows off the brilliant (and difficult-to-photograph) metallic colors well, and I like the animated look of the slightly cocked head. 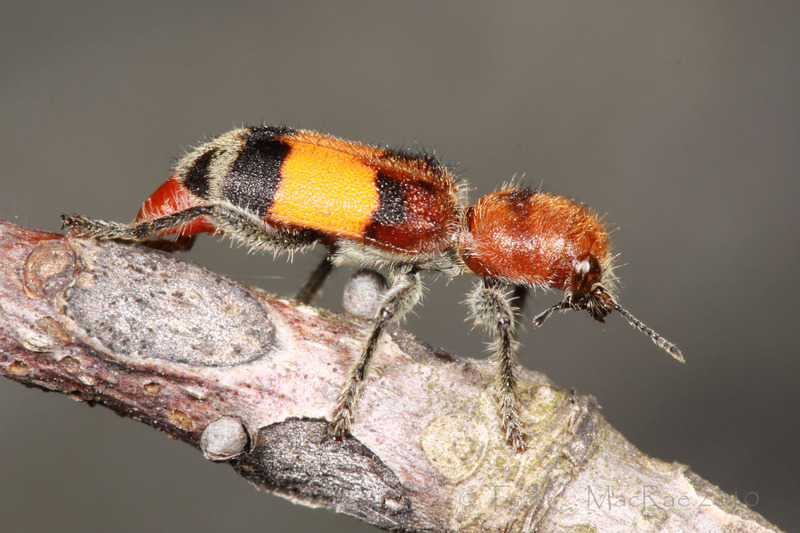 From Orange-banded checkered beetle (posted April 22). The even gray background compliments the colors of the beetle and highlights its fuzziness. 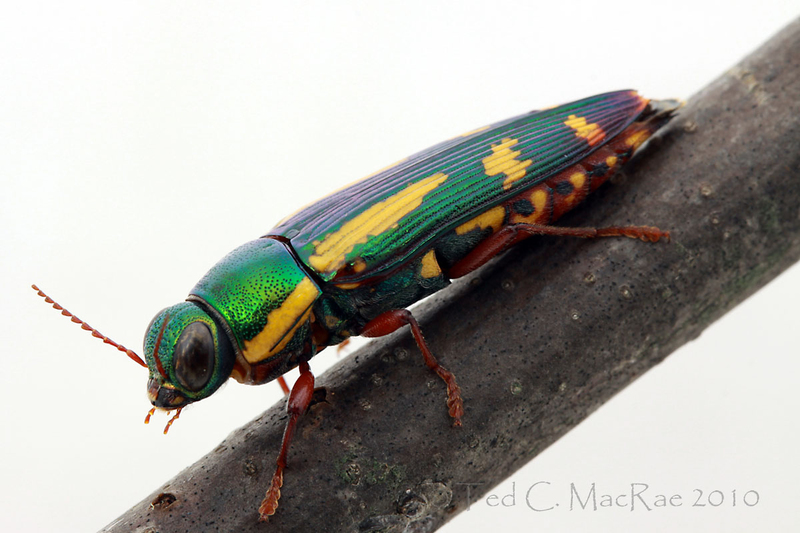 It was achieved entirely by accident – the trunk of the large, downed hickory tree on which I found this beetle happened to be a couple of feet behind the twig on which it was resting. From Euhagena nebraskae… again (posted October 21). 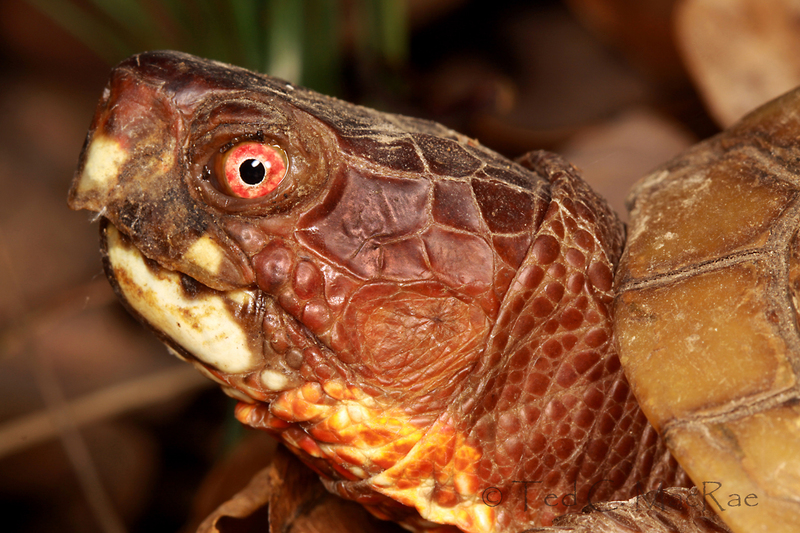 I photographed this species once before, but those photos failed to capture the boldness of color and detail of the scales that can be seen in this photo. 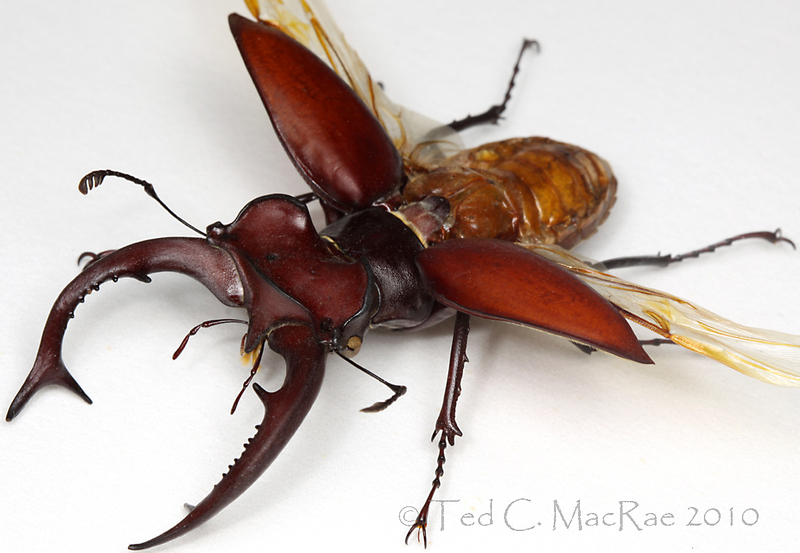 From North America’s largest stag beetle (posted December 30). I’ve just started experimenting with photographing posed, preserved specimens, and in fact this male giant stag beetle represents only my second attempt. It’s hard to imagine, however, a more perfect subject than this impressively stunning species. From North America’s largest centipede (posted September 7). Centipedes are notoriously difficult to photograph due to their elongate, narrow form and highly active manner. The use of a glass bowl and white box allowed me to capture this nicely composed image of North America’s most spectacular centipede species. 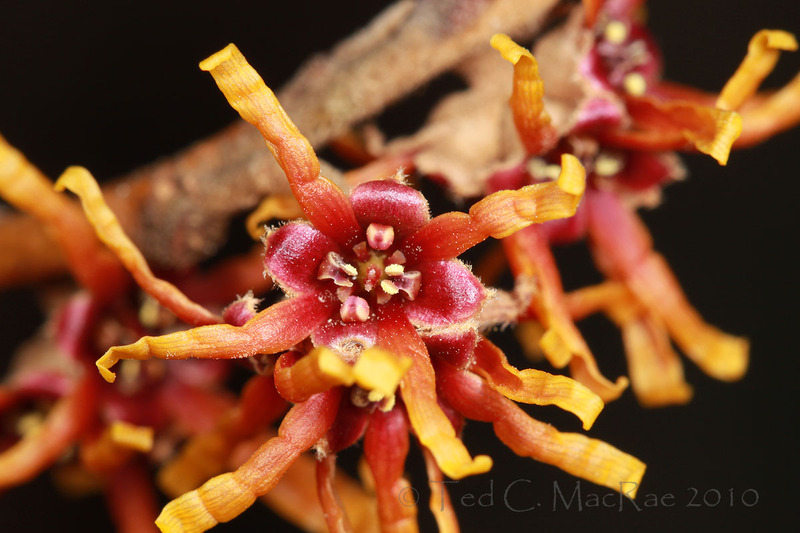 From Friday Flower – Ozark Witch Hazel (posted March 26). The bizarre form and striking contrast of colors with the dark background make this my favorite wildflower photograph for the year. From Eye of the Turtle (posted December 10). I had a hard time deciding on this category, but the striking red eye in an otherwise elegantly simple photograph won me over. It was also one of two BitB posts featured this past year on Freshly Pressed. From Jeepers Creepers, where’d ya get those multilayered retinae? (posted October 5). I’m not anywhere close to Thomas Shahan (yet! ), but this super close-up of the diminutive and delightfully colored Phidippus apacheanus is my best jumping spider attempt to date. A new diffuser system and increasing comfort with using the MP-E lens in the field at higher magnification levels should allow even better photos this coming season. This entry was posted in Arachnida, Araneae, Buprestidae, Cerambycidae, Chilopoda, Cicindelidae, Cleridae, Coleoptera, Hamamelidaceae, Lepidoptera, Plantae, Reptilia, Scolopendromorpha, Sesiidae, Vertebrata and tagged arachnids, beetles, centipedes, checkered beetles, clearwing moths, entomology, herpetology, insects, jewel beetles, jumping spiders, longhorned beetles, moths, nature, reptiles, science, spiders, tiger beetles, turtles, wildflowers. Bookmark the permalink. Great photos, Ted. Your pictures get better and better. 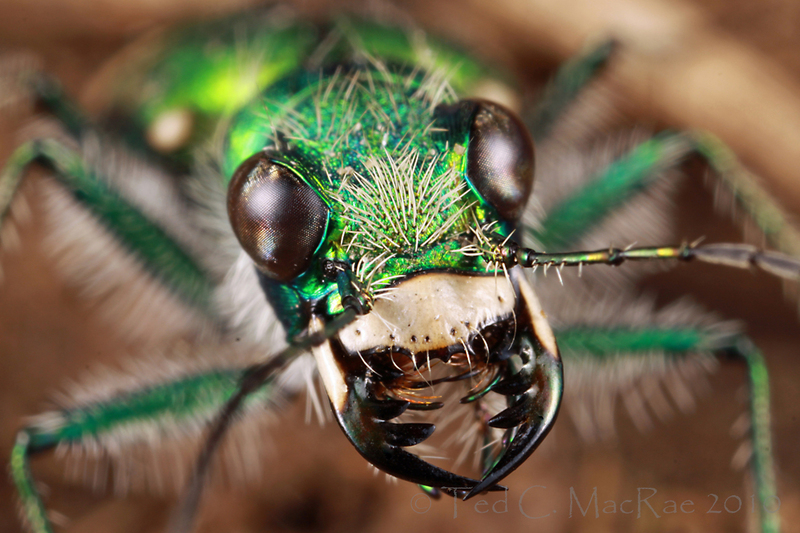 Great photos the head shot of the tiger beetle is great. How did you ever get that photo ? Around here (central Ohio) they tend to be very skittish and difficult to stalk. That individual was confined in a terrarium, so I was able to use the 65mm macro and get pretty tight. I have taken some head shots with that lens in the field, but as you note they are much more difficult to get with unconfined individuals. Beautiful photos Ted. Even though tiger beetles are my bag, and that C. denverensis photo is fantastic, I must say that the clearwing moth photo is really outstanding, as is the centipede photo. We see those giant centepedes fairly often while in southeast Arizona. They always give you a start! When will your first photo book appear! Thank you, Charlie! Until I found this individual, the only scolopendromorph centipede I’d ever found was a road-killed in extreme southwestern Missouri. Never managed to see one during my several trips to Arizona, despite lots of looking around at night. dried cowchips after a summer rain in southeast AZ while looking for carabids. of Cicindela. It is also a good way to find scorpions in that region. Yes, I now look under boards and dried cow chips whenever I get a chance – I wasn’t tuned into this in the days when I was going to Arizona. I’ve not yet run into tiger beetles underneath cow chips. 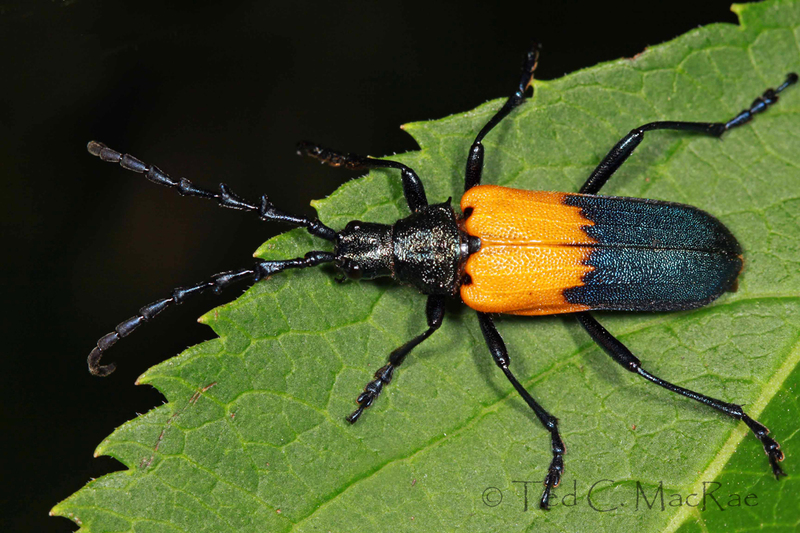 The most unusual thing I found underneath such was Parandra glabra (might be in a different genus now) at high elevation in Ecuador – I couldn’t believe I had found longhorned beetles underneath cow dung (not one, but several). Collecting is so much fun! As Charlie mentioned, I’ve also encountered different species of Carabids and Cicindelids, not to mention assorted Scarabs, under cow chips. A good technique for collecting C. debilis – which many collectors seem to miss – in the grasslands and flats surrounding Willcox Playa and the upper highlands and pastures. I guess the beetles seek refuge there because it will retain moisture and humidity for several days (if not weeks) even though the adjacent soil is dry. Cool info, thanks! I’m just dying to get back out to AZ – it’s been over 12 years now, and I’ve learned a heck of a lot since then. I suspect cow chip collecting might be more effective in the arid west than around here. You really don’t find much of anything under dry dung chips, while moister patties will have the usual dung beetle assortment (Geotrupes, Onthophagus, Copris, Canthon, and Phanaeus if you’re lucky). Not knowing much about insect, i still love to look at the colors and shapes of them. I remember seeing some Clearwing moths mimicking the flight pattern and sound of the hummingbird and how surprised i was when one landed gently on a flower just beside my hand. I love to visit your site, so interesting. Thank you, Francis. I appreciate your interest and readership. I wonder if that might have been a hummingbird moth that you saw (sphinx moths that fly during the day and have clear areas on their wings – they imitate hummingbirds in both the sound and appearance of their flight). I could be, the thing i remember is the look it had in flight with something like a hummingbird beak and tail feathers, look like those. Yes, that is exactly what I was thinking of. They call it a hummingbird clearwing moth because of the clear areas on the wings, but it is in a different group from the true clearwing moths like the one I have in my photo. Thanks, liewwk – best of 2011 to you as well. All fantastic, Ted! In my book, that jumping spider wins for cuteness, the centipede for size, and tiger beetle for overall awesomeness. Nice choices – I think I like the stag beetle best (probably because it’s the newest one). Great photos Ted. All great but especially like the Scolopendra heros and the Buprestis rufipes! I’m still in awe of the scolopender! What a fin year indeed, Ted. Wow! Your photography continues to amaze me, and I sincerely think you get better with each picture taken. As for favorites from this bunch… Well, jumping spiders never fail to awe me with their looks and charisma, but I have to go with the centipede. Those guys are just too fantastic. You captured their brooding charm and colorful persona in a mesmerizing image. The only better view of one is in the flesh. Hi Jason – I appreciate all the support and encouragement you’ve given me during the past year! 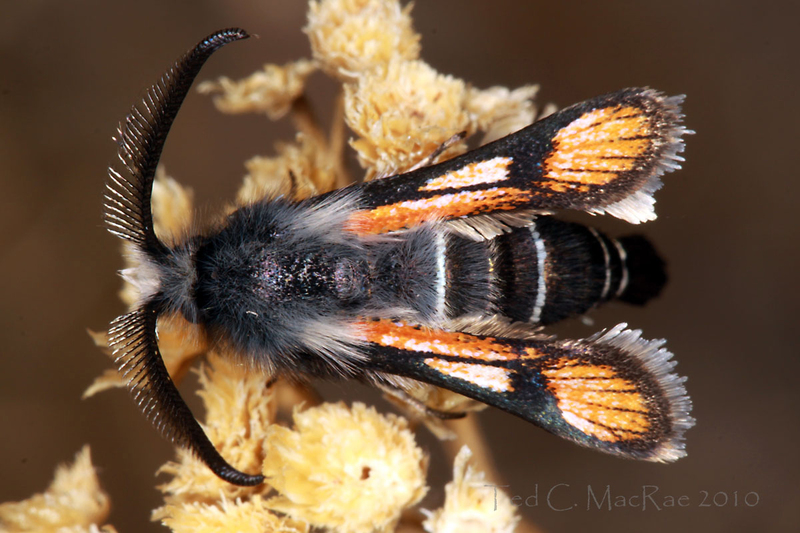 I remember all these photos clearly – except for the clear-wing moth! I’ll have to go back and read that one. 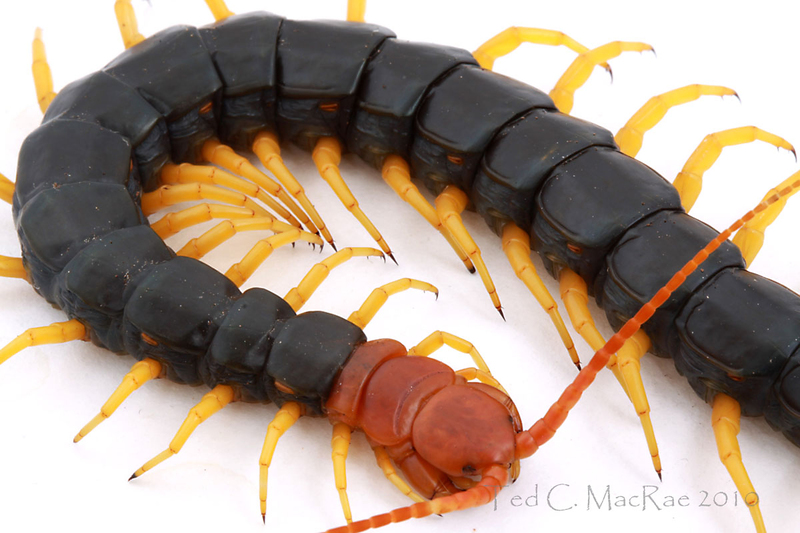 I think the series with the biggest impact for me was of the scolopendromorph centipede. Thanks for all the great posts, Ted. All the best for you in 2011! You’re welcome, and thank you for your enjoyable commentary, Adrian! Here’s to a great 2011. Looks like the centipede is running away with this competition (to be expected, I guess, with that many legs!). I LOOOOOVE Jumping Spiders! Great pic! Oh, jumping spider makes a surge. Darn good stuff, Ted. 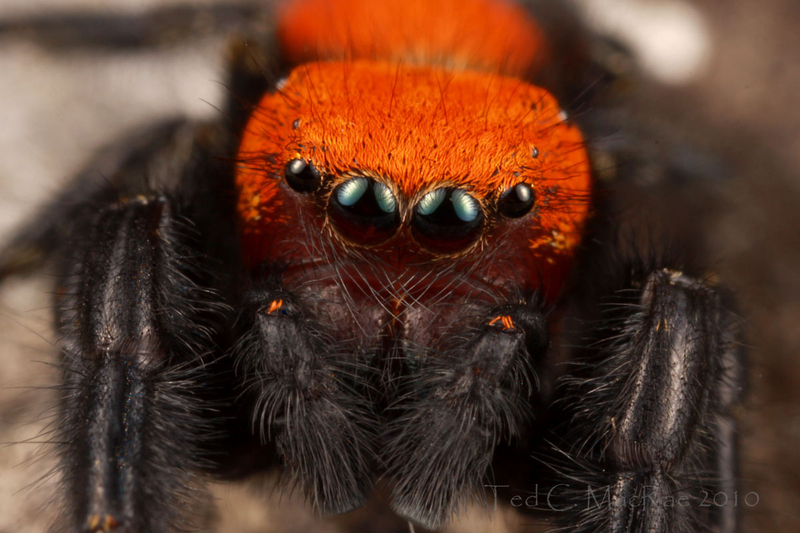 I think the jumping spider is my favourite of the lot…the colours and textures are fantastic! I just went back and had a look at your “best ofs” from ’09 and ’08…wow! You’ve come a long way in a very short period of time. I can’t wait to see what you come up with for next year’s bests, and expect to continue to be inspired by your work. Happy new year! Definitely a two-horse race now! Thanks so much, Geek. I appreciate your readership and fun perspective on my posts. Here’s to continued inspiration in 2011. Excellent photography, Ted! Really amazing shots. 2010 was a good year for you, it seems. Thanks, Kolby – nice to hear from you! Great shots (and impressive talent). Keep up the inspirational work. Im investigating how such a change is made in their lives of insects as a result of global warming. following your blog and articles. Thanks, Böcek. I’m still trying to figure out how insects live to begin with, much less how their lives will be affected by global warming. Gorgeous photos. I’ve finally been able to identify a colorful red-legged beetle that happened to fly onto my porch a few years back (the jewel beetle). I wasn’t fast enough back then to get a photo of it. That green tiger beetle looks like it has ant mandibles. Is that unusual for beetles?